The need to be able to take a representative sample of a hydrocarbon product is necessary to ensure proper accounting for transactions and efficient product processing. The various sampling methods that are available and the options and limitations of these methods are investigated; the most appropriate equipment to use; the reasons for its use and correct installation of the equipment are also addressed. The amount of hydrocarbon product that is transported between producer, processor, distributor and user is significant. To be able to verify the exact composition of the product is important from an economic and product treatment standpoint. A small percentage savings made by correctly determining composition will quickly recoup the investment made in the purchase of a system designed to obtain an optimum sample. In addition, if the best sampling procedures are followed, the potential for disputes between supplier and customer will be greatly reduced. The importance of properly determining hydrocarbon gas composition benefits all parties involved and will achieve greater significance as this commodity becomes more widely used in our energy plans and more expensive. From the Gas Processors Association publication GPA 2166-05, “The objective of the listed sampling procedures is to obtain a representative sample of the gas phase portion of the flowing stream under investigation. Any subsequent analysis of the sample regardless of the test, is inaccurate unless a representative sample is obtained.” And, from ISO-10715, a representative sample is, “A sample having the same composition as the material sampled, when the latter is considered as a homogeneous whole.” API 14.1 offers a similar statement in the latest revision, “a representative sample is compositionally identical or as near to identical as possible, to the sample source stream”, as does ASTM 5287-97. These standards are the most common referenced on Gas Sampling procedures, along with the AGA Gas Measurement Manual, Part No. 11, Section 11.3. Proper sampling is fundamental to the correct determination of the product composition. In a majority of cases, the sample is also the source for the determination of the specific gravity of the gas. This figure is a critical component of the flow formula, from which we derive the product quantity. An error in sampling effects both quality and quantity, and ultimately, profitability. Most current Gas Chromatographs boast an accuracy level of ½ of a BTU, but that should not be the comfort zone for the measurement department. A faulty sampling method or improperly installed and maintained equipment may alter the BTU content of the flowing stream by 25+ BTU. While the accuracy of the GC may be considered as a given, the properly executed technique for taking the sample is certainly not a given. Natural Gas sampling has been performed for years with techniques handed down from generation to generation. Most of the methods are not sufficient to meet today’s requirements of accuracy and repeatability; however, standards have been developed to reach toward these demands. The most widely known standards are GPA-2166-05 and ISO-10715. API has produced a revised API 14.1, which was published in June, 2001. It has been updated and revised in 2006. This new standard has already generated significant interest in proper sampling techniques, due to a large volume of data produced during the revision work. Proper maintenance of all sampling equipment is vital to the operations of all sampling methods. A review of relative sampling standards and the manufacturer’s operation, installation and maintenance manuals, is an important step the total accurate sampling process. Dirty or poorly maintained sampling apparatus will adversely affect the final results and profitability of the gas company’s operation. Sampling can be accomplished by primarily three techniques; spot, continuous composite or continuous on-line sampling systems. The various components of a sampling system deserve individual consideration, before the various sampling procedures are investigated. Regulators – On-line analysis should use regulators to reduce the pressure to the analyzer. They will reduce the gas volume to the sampler, thus minimizing the time delay between the sample point, via the regulator, to the analyzer. This will lessen any negative effect on the gas sample by ambient conditions. Insertion type regulators are preferable as they will be able to reduce the sample pressure in the flowing stream enabling a minimization of the Joule-Thompson effect created by the pressure drop. Valves – If shut-off/isolation valves present a restriction that causes a pressure drop, it is possible that condensation could occur. When used with a collection cylinder it is important that there are no leaks from the gland. Light ends will be the first to leak off, thereby causing the sample to be overrepresented with heavy ends. It is wise to use valves with soft seals to give a positive shut-off. 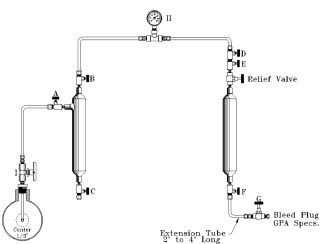 Large orifice valves should be used, as restrictive valve paths can cause fractionization of the sampled gas. Filters – For on-line analyzers, it is sensible to install a filter. Proper selection of the filter flow capacity and the particle size capacity should be encouraged. A filter that is too small or does not have a sufficient drip pot capacity for gases that have entrained water, is a recipe for high maintenance and off spec analysis. It is prudent to invest in a reasonable filter. Relief valves – Regulators should have a relief valve installed downstream, if the equipment downstream is not able to withstand full upstream pressure. Regulators will not always give a guaranteed shut-off and their lock-up pressure will climb to a dangerous level should there be failure to attain a good shut-off such as seal damage, diaphragm damage or impurity build-up on working parts and sensing lines. Pipework – Should be as short and as small a diameter as possible. This will assist in minimizing the time delay from sample point to the analyzer or cylinder. It will also help maintain the sample integrity. When used with on-line analyzers, sample delivery lines should slope upward from the probe to the analyzer to prevent condensation and impurities entering the analyzer. Lead lines to continuous samplers should slope back towards the pipeline. Heating Elements – There is sufficient evidence to show that heating all components of a sampling system is a prudent step in having a reliable and accurate sampling system. The hydrocarbon dew point of a natural gas stream is a critical issue in obtaining a representative gas sample. Probes – The correct placement is at the top of the pipe, into the center one third or at least 200 mm (8 inches) for larger diameter pipes; in an area of minimum turbulence, that is, away from headers, bends, valves, etc. Turbulence will stir up the contaminates that usually reside at the bottom of the pipeline and are therefore not normally part of the gas stream. By having the probe at a point of turbulence these contaminates will be taken into the sample, giving a sample that is not representative. The key is to have the probe in the center of the line in the correct spot (positive velocity/no turbulence) with a proper valve on the outlet. Field applications have shown that mounting the probe on the top of the pipeline is the preferred location. Side or horizontal mounts can easily encourage free liquids (if present) to migrate into the sample system. Sample Pump – These pumps are, of course, needed to extract the sample from the line and transfer the sample to the analyzer or collection cylinder. They should have the capability to be able to extract the sample under flowing conditions, maintain a consistent discrete size of sample, take a fresh purged sample every time and have the ability to be controlled by a timer or proportional-to-flow controller. This forms the heart of the continuous gas sampling system. If the pump or sampler is unable to perform all these functions, a representative sample will not be taken and the sampling exercise will be flawed. Pumps can be either pneumatic or electric. The safety requirements of the electrical components such as motors and solenoid valves and the environmental protection rating, dictate careful selection and compliance with applicable codes. The selection options may well be limited if electrical components have requirements which are incompatible with the use of standard components elsewhere in the system. Sample Cylinders – Used for the collection of gases and light liquid hydrocarbons, sometimes called “sample bombs”. The cylinders come in two forms; one is a plain single cavity cylinder with a valve at each end, and the other is known as a Constant Pressure Sample Cylinder, which takes the form of a closed end cylinder with an internal piston. Before using this cylinder, one side is pressurized forcing the piston to the sample end. When the sample is taken, the product is then collected and stored at whatever pressure is pre-charged at the back of the piston. Using the Constant Pressure Cylinder the sample can be collected at a pressure above the vapor pressure of the light ends. By having the piston at the end of the cylinder, the need for excessive purging is eliminated. Pulling a vacuum in the sample cylinder (which is often destroyed by technicians) or using the water outage method is not necessary. It can be guaranteed that the sample taken is composed entirely of the gas being sampled. The hook-up is simple and straightforward making the operation easier for technicians and minimizing the possibility of an incorrect sample being taken. Sample cylinders should be constructed with a material that is compatible with the gas. For instance, H2S can be absorbed into the structure of 316 stainless steel. This will necessitate coating the inside of the cylinder. The resultant sample will not be truly representative otherwise. Sample cylinders are normally protected with bursting discs. They are less expensive and are lighter weight than relief valves, though their proper selection and replacement should have more importance than is sometimes given them. With all of the notes on the various components should go the comment which is one of the basic rules of sampling. The materials of construction of the sampling equipment that come into contact with the sample are to be compatible with the product being sampled. It is normally reasonably safe to use 316 stainless steel and Viton elastomeric components. One should look for these materials in selecting equipment, and ask questions of suppliers about material selections. An additional major factor in correct sampling procedures is an awareness of the hydrocarbon dew point of the gas stream being sampled. The importance of knowing the HCDP is related to 1). The ambient temperature; 2). The temperature of the equipment being used to collect the sample; and 3). The temperature of the flowing stream. The creation of liquids due to equipment design and equipment temperature must be avoided. Determination of the HCDP of the gas stream can be done by the chilled mirror method or by the use of a number of equation of state models for hydrocarbon dew point determination. There are several programs available such as Peng-Robinson or SRK. The variations of the calculated results between different equations of state are so wide, that it is strongly recommended to add 20° to 50°F (11° to 28°C) to the answers. This is to assure the operator that he is designing his sampling system temperature requirements above the actual hydrocarbon dew point. Both API 14.1 and GPA 2166 can provide a wealth of information regarding HCDP issues and the various options available to limit or eliminate the negative aspects on sampling systems. This is very critical information. Spot sampling was the primary method of acquiring a sample for analysis until the early 1970’s. This method is still widely used today. In today’s world of growing trends toward therm-measurement and therm-billing, this method is increasingly expensive in analytical cost and man-hours, as well as a very questionable method of assessing an accurate heating value to volume sales. It is at best a “spot” sample of what was present at the moment the sample was taken. Minutes before and minutes after become unknown guesses. While this may be a reasonable risk if the gas source is known by a long historical data base, most gas being consumed today is a combined gas from several origins, or is switched from source to source by contractual updates; in some cases by daily or even hourly arrangements. This author has been on location and witnessed a 62 BTU increase at a single sample point, within a one-hour time frame. It was mainly attributed to both a substantial increase and decrease in flow rate as well as well selection changes within the gathering grid. Also, we find typically, that the older the well and the longer it stays in production, the higher the BTU value will become. Natural gas is an extremely fragile product and almost every step in the production, transportation and distribution of natural gas, will have an adverse effect on its quality. Switching wells, pressure changes, temperature changes and storage vessels are only a few of the items that can add or subtract BTU values on the gas moving through measurement stations. Thus, a spot sample may not even represent the correct source in question. Because of the increasing cost of one BTU, more and more companies are improving their methods, and departing from older spot sampling practices. Composite sampling is the proven middle ground between spot sampling and the continuous on-line analytical gas chromatographs. Composite or Grab sampling is the collection of the gas by direct introduction into a sample cylinder from a probe/valve combination or by means of a timed or proportional-to-flow sampler. A composite gas sampler or gas sampling system consists of a probe, a sample collection pump, an instrumentation supply system, a timing system and a collection cylinder for sample transportation. Its sole objective is to collect and store a representative composite sample at line conditions, allowing it to be transported to the laboratory for repeatable analysis. This package will mount on a pipeline and collect samples over a desired sample period unattended. For the sake of illustration, a description of a common system is provided here. A probe should be installed which extends into the middle 1/3 of the flowing stream. This location should be chosen to provide a representative sample of the gas stream, thus devoid of stagnant gas, i.e. blow down stack, and devoid of free liquids and aerosols, i.e. downstream of piping elbows or orifice fittings which cause turbulent flow. The probe should have a large ported outlet valve to prevent fractionation, resulting in compositional changes in the gas. A self-purging sample collection pump designed to operate under line conditions should be located above and as close to the probe as is practical and possible. Filters, drip pots, screens, regulators and such conditioning equipment shall not be placed between the probe and the sampler, as this will affect the representative nature of the sample which is taken. Inlet check valves can also cause the gas to fractionate, due to the restriction it causes in the line. The sampler instrumentation source can be from the pipeline itself (the most common installation) or from an auxiliary instrument supply. Using the grab sampler, it is possible to obtain a representative sample over a pre-determined period. It is the only practical method for collecting a continuous sample. The grab sampler will introduce a set volume, taken in equal amounts to the collection cylinder over a set period and is the preferred method when a representative sample has to be taken over time. It has the advantage of being able to measure precisely a predictable amount over a given period when using a timer, and can also take samples proportional-to-flow when taking a modified signal from a flow meter. The timing system can be a simple function timer and solenoid, a proportional-to-flow signal conditioner and solenoid, or simply, a solenoid ready to be connected to field RTU’s or other electronic devices capable of providing the desired signal. 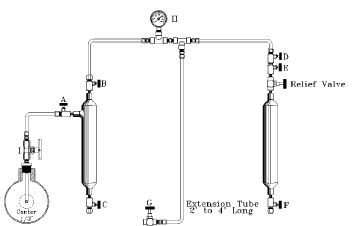 In addition, the sample is taken from the flowing stream at the system pressure and can be fed into the sampler or sample cylinder at the flowing pressure; thus any change in composition is avoided. Another feature required of any sampler is that it should not have areas or pockets where residue of previous samples can accumulate and, must take a fresh grab or bite of gas each time it samples. 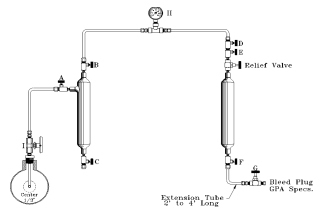 In early years, some composite sampling methods were used where by the gas was introduced into the cylinder by bleeding through a regulator until it reached line pressure, and then was transported to the laboratory for calorimeter or chromatograph analysis. As the known quality of the gas (BTU value) became more important, tests were conducted to determine if the gas was being altered by the procedure used to fill cylinders. Ambient temperature conditions could play a role in the filling or non-filling of the cylinder and thus alter the integrity and representativeness of the sample in the cylinder. The need for maintaining the gas at full line pressure from beginning to end became evident. Any reduction in pressure and change in temperature from the line condition at the time of sample was deemed to alter the gas analysis in almost every case. Only low BTU gas (975 BTU and below) seemed to possibly escape alteration. The selection of the type of cylinder and the design of the sampler extractor became important considerations for an effective sample collection system. There are primarily two basic types of sample cylinders used in the industry today. First is the single cavity, spun end cylinder known as the Standard Cylinder. It became evident that when the Standard Cylinder was being filled, the heavy ends dropped out as condensate in the cylinder until higher pressures were reached in the filling process. But when the cylinder was being bled into the chromatograph, there was no way to keep the pressure elevated in that cylinder. As the cylinder was opened, the light ends escaped first, thus giving a certain BTU value. As the analysis continued, the BTU value increased due to the heavy ends remaining in the cylinder, thus altering the BTU value in a higher direction. As it is normal that more than one test is performed, due to concerns of accuracy or custody transfer, repeatability was more often than not, impossible. It became clear that the decrease in pressure was altering the gas composition. Second is the internal piston or sliding piston, Constant Pressure Cylinder. It was in this environment that the Constant Pressure Cylinder was designed and created. With an internal piston with seals, it was possible to pressurize (pre-charge) the cylinder with an inert gas supply (or the pipeline gas itself), and then turn the cylinder around and fill it slowly from the opposite end. By letting the gas push against the piston while “slowly” venting the pre-charge gas, the sample was taken at full line pressure from start to finish. Then, in the laboratory, a gas supply could be connected to the pre-charge side equal to the pipeline pressure. As the sampled gas is injected into the chromatograph, the piston is being pushed by the pre-charge gas. While the cylinder is being emptied, full pressure is being maintained and the gas composition is not being altered as a result of pressure reduction. The cylinder can be stored, or sent to another laboratory for confirmation, and when the remaining gas is analyzed, it will give repeatable results, because the condition of the gas is maintained by the constant pressure cylinder. The cylinder is equipped with valves, safety reliefs and gauges on both ends, and thus the pressure can be controlled and monitored at all times on both ends. The temperature is maintained just as with Standard Cylinders i.e. heating blankets, ovens, or water baths. This procedure has proven to give extreme accuracy in both spot sampling procedures as well as in automatic sampling systems. The Constant Pressure Cylinder has been tested against the laboratory chromatograph and on-line chromatographs, and has shown to maintain the integrity of the sample to within 1/2 BTU of the pipeline gas. No other method consistently performs at this level. Also, the richer the gas, the more alteration occurs with older methods. The Constant Pressure Cylinder also brings with it, additional safety in handling the sample. No longer do you have to purge the cylinder and vent large amounts of gas to the atmosphere. A brief purge of the sample line up to the cylinder is all that is required. The piston is at the sample end of the cylinder when you commence to fill, so there is no “dead volume” to purge. Also, because of the design of the cylinder, with seals on the end of caps, it cannot be over pressured to the point of exploding. If the cylinder is over pressured, the safety reliefs will allow the pressure to escape. In the rare event that they fail to work the cylinder will swell and the seals will stop sealing, allowing the product to escape safely. Constant Pressure Cylinders have served the industry for 40 years to provide accurate sampling procedures, better sampling systems, repeatability, safer handling, accurate analysis and storage of samples as well as storage of gas and liquid standards for the laboratory. All updated ISO, GPA, ASTM and API standards and committee reports, address the proper usage of Standard and Constant Pressure Cylinders for the gas and liquids industry. . As these cylinders will be transported, they should meet design criteria such as ASME Section 8 or carry approvals from recognized agencies such as D.O.T., DNV, Lloyds, etc. A typical system would include a 500ml cylinder which would be used on a monthly basis to contain 2200+ bites of .2 cc size during the sample period. This then describes a typical continuous composite sampling system, which has been proven to provide a representative sample for analysis. Such systems have been tested against continuous on-line gas calorimeters and gas chromatographs with + 1 BTU accuracy for the total sample period, at considerably less cost and maintenance than on-line GC’s. The transportation of natural gas samples is a very important issue for both the companies that are involved and the individual personnel who are transporting the samples. The United States Department of Transportation (DOT) covers the transportation of samples in CFR-49. Everyone involved in transporting sample cylinders and other sampling apparatus, both to and from sample collection locations, should be familiar with the rules and regulations set forth in CFR-49. Other company procedures that will assist in the success of a quality sample being delivered to the laboratory for an accurate analysis. The methods, techniques, and designs of today’s sampling systems should be considered by every producer, shipper, buyer and end-user. Regardless of the application or installation, there is a system which meets your needs, and will affect your company in the profit and loss column. Sampling and metering are the cash register of your company. Sampling is an art! Examine your methods, procedures and needs closely. Open Valve ‘I’ to blow any accumulated foreign matter in probe or valve. Connect manifold to probe Valve ‘I’ (close Valve ‘I’). Open Valves ‘A’, ‘B’, ‘D’, ‘E’, and ‘F’. Valves ‘C’ and ‘G’ remain closed. Open Valve ‘I’ to allow full pipeline pressure to fill complete manifold. Close Valve ‘A’ and open Valve ‘G’ to allow gas in the manifold to bleed to 0 psig. Close Valve ‘G’ and open Valve ‘A’ to allow pressure to build rapidly to full line pressure. NOTE: Steps 4 through 6 should be repeated until all air has been eliminated from the system (3 to 5 times). Open Valve ‘A’ quickly to fill manifold with full pipe­line pressure. Close Valve ‘A’. 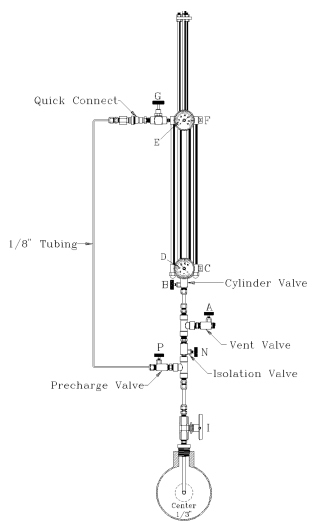 Open extension Valve ‘G’. Allow pressure to bleed to 0 psig. Close Valve ‘G’. NOTE: If at any time liquids appear at Valve ‘G’, the sample should be discarded. NOTE: Steps 7 and 8 constitute the fill and empty cycle and should be repeated as many times as required by your pipe­line pressure and the chart below. Table 1 gives the mini­mum number of purges required to condition your sample cylinder (providing the sample cylinder is clean and dry). At the completion of the proper number of purge cycles, close Valves ‘E’, ‘F’, and probe Valve ‘I’. Bleed the pressure from the manifold and extension tube. Remove the sample cylinder from the manifold and check for leaks. Plug the valves. Fill out the proper sample tag and put the cylinder in a proper carrying case to be transported to the lab. Caution: This method should not be used on wet natural gas or gas over 400 psi. Open Valve ‘I’ to blow out any accumulated foreign matter in probe or valve (close Valve ‘I’). Connect sample manifold to probe Valve ‘I’. All valves closed. Slowly open Valve ‘I’, and then slowly open in sequence Valves ‘A’, ‘B’, ‘D’, ‘E’, ‘F’, and ‘G’. NOTE: Valve ‘G’ must have flow plug installed. Allow gas to flow through the manifold for a minimum of 3 minutes. NOTE: That more time will be required if the sample cylinder has not been properly cleaned and dried. NOTE: G.P.A. method should be consulted for unusual conditions. After specified time, valves should be closed beginning with Valve ‘G’ and working toward the source valve, sequence ‘G’, ‘F’, ‘E’, ‘D’, ‘B’, ‘A’, and ‘I’. Bleed pressure from manifold and remove sample cylinder. Check cylinder for leaks and plug valves. Fill out sample card and put cylinders in proper box for shipment. Evacuate a clean sample cylinder and plug valves. Open probe Valve ‘I’ to clean valve and probe of accumu­lated materials. Connect manifold to probe Valve ‘I’. With all valves closed, attach sample cylinder to mani­fold. NOTE: Check with a gauge to ensure sample cylinder is evacuated. Open probe Valve ‘I’, ‘A’, and ‘B’. All other valves closed. NOTE: Sample gauge II will indicate pipeline pressure. Open Valve ‘G’ on the extension tube. NOTE: This will bleed manifold pressure to 0 psi. NOTE: Steps 6 and 7 constitute a purge of the piping to the evacuated cylinder. This should be repeated as required by your pipeline pressure to ensure any air in the lines has been purged with gas. Open Valve ‘A’ with Valve ‘B’ open, slowly open Valve ‘D’ and allow line pressure to fill sample cylinder. Close Valve ‘D’. Close Valve ‘I’. Open Valve ‘G’ to remove pressure from the sample manifold. Remove sample cylinder from manifold. Check for leaks, plug valves, fill out sample information, and put cylinder in an appropriate case for transportation. To draw a spot sample into a constant pressure sample cylinder, the following procedure should be used. Has the cylinder been emptied, cleaned, and checked for leaks? Attach to the precharge Valve ‘G’, a supply of inert gas (N2), with Valve ‘B’ open, and fill the cylinder to 100 psi above line pressure. Close Valves ‘G’ and ‘B’. Put the cylinder in a carrying case with the proper transport papers, and go to the field. With an appropriate connector, connect Valve ‘B’ on the cylinder to the process connection ‘I’ (sample probe). 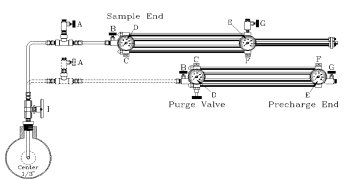 Valves ‘I’, ‘A’, ‘B’, and purge valve are closed. Open Valve ‘I’. Check the connections for leaks. Open Valve ‘B’. This allows product to flow into the cylinder to the face of the piston. Purge: Close Valve ‘I’ with ‘B’ open, open ‘A’ (slowly). Bleed off the product in the cylinder. NOTE: By opening ‘I’ and ‘A’, you fill and empty the piping and cylinder to eliminate air or contaminants. If the pressure is above 500 psi, 3 to 5 purges will be adequate. Do not flow through with all valves open. This may cause retrograde condensation to occur. Open Valve ‘B’. Valve ‘A’ remains closed. Product is now against the face of the piston. Slowly open Valve ‘G’. Bleeding off the precharge from the back side of the piston will allow the process pressure to fill the sample container. When the indicator reaches 80%, close Valve ‘G’. You now have 80% product, 20% precharge, and the cylinder may be transported. Close Valve ‘I’ (probe valve) and Valve ‘B’. Slowly open Valve ‘A’ to remove the pressure between the purge valve and cylinder inlet valve ‘B’. Remove connection at Valve ‘B’, plug all the valves, fill out the paperwork, and put the cylinder in a carrying case for transportation. Sample taken by simply viewing into a convenient valve is not a proper means by which to take a representative sample of any type. After receiving his Bachelor of Theology degree in 1970 from Baptist Bible College/Texas College of Theology, David J. Fish began his career in the oil and gas industry over 39 years ago. David's extensive experience and knowledge of the industry has allowed him the opportunity to travel around the world for 25 years partaking in speaking engagements as well as, an instructor at various measurement schools. With over 10 publications, including articles in the Pipeline & Gas Journal and the Oil & Gas Journal, David's accolades have gained him the esteem in the sampling and measurement world. His involvement in the industry goes beyond speaking, instructing, and writing. David also serves as an Executive Committee Member for the International School of Hydrocarbon Measurement and serves as Vice Chairman of API's Committee on Measurement Quality and ASTM's D02.02 as well as Welker's voting member for API, ASTM, GPA, ANSI, and ISO. In his free time, this husband and father of 4 and "GrandDude" of 11, enjoys golfing, hunting, and teaching an Adult Sunday School.